What does a Money Mizer Pawns and Jewelers Franchise Franchise Cost? 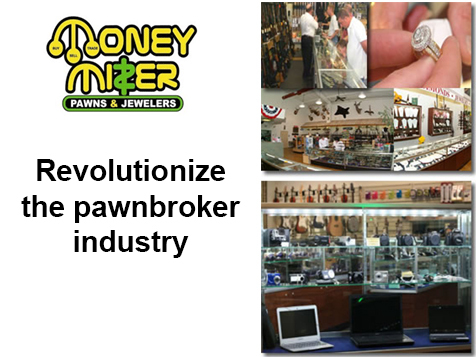 Money Mizer Pawn & Jewelry is revolutionizing the pawnbroker industry, bringing its specialty niche money services and quality retail products to a wider range of clients. Join a franchise system of highly-motivated, select franchisees in an innovative and richly rewarding money services and retail opportunity. Open Money Mizer Pawns and Jewelers Franchise in any of these available states: AL, FL, GA, LA, MS, TN, TX. Eclectically Distinctive: Customers are drawn into Money Mizer by an attractive, inviting store that is spacious, orderly, and neatly arranged with an array of fascinating products to explore – both new and used. They find one section dedicated to selling new and pre-owned jewelry on par with any high end jewelry store, but with much lower prices. In other sections they find top quality sporting goods, computers, cameras, antiques, and a wide variety of goods. With upscale displays and decor, Money Mizer attracts customers who do not typically frequent more traditional pawn shops. Specialty Niche Money Services: Customers develop long term relationships with Money Mizer Pawn & Jewelry because we offer a Money Mizer Franchise 03convenient and confidential way to borrow money. Short-term cash needs can be met with no credit check or legal consequences if the loan is not repaid. Pawn loans do not cause people to overextend credit or go into bankruptcy. For the millions of Americans with no bank, Money Mizer also offers convenient check cashing services. Standardized Layout: Each Money Mizer store is based on a standardized CAD-designed prototype, which assures visual consistency and brand recognition, synonymous with typical high end stores in retailing. A cross between a financial service business and a fine jewelry store, Money Mizer locations have walk in vaults, check cashing windows, plus jewelry and retail display cases to rival the finest in any store. State-of-the-Art Equipment and Technologies: Money Mizer’s computerized inventory, firearm records and sales tracking abilities are premier Money Mizer Franchise 02in the industry. This helps us provide an array of invaluable services and gives us greater flexibility when dealing with and pricing trade-ins and buying merchandise from the public. Highly-Trained, Friendly Employees: Customers can expect to find Money Mizer staff friendly, knowledgeable, and concerned with the customer’s best interests, whether the customer is getting a needed loan or purchasing a new or used product. We value each team member, and ensure that each one meets our high standards and training requirements. As part of our network, you and your staff will undergo the same training and will learn how to build a solid team of quality employees, consistent with the Money Mizer identity. We have a 90% retention rate of loyal employees over the last 5 years. Site location assistance, guidance on working with contractors, and standardized CAD designs for your store location’s layout. On-site start-up assistance, periodic visits, accounting audits and legal compliance reviews to help ensure your business is running in top form. Established operational procedures and standards all detailed in a comprehensive and confidential operations manual. A full set of Money Mizer business forms and supplies, as well as templates of any necessary federal and state required forms. State-of-the-art equipment and specialized Pawn Master Software that help you operate efficiently, track sales, monitor inventory, keep accurate records, and more. Cooperative advertising efforts and agency-negotiated rates, plus professionally prepared ad templates, brochures, and vendor banners, to help you project a professional image in your local market at reasonable costs. Free membership in the respected National Pawnbrokers Association. Guidance on ordering initial equipment, supplies, and inventory. Ongoing educational communications to keep you apprised of the latest industry news, alerts, and key information. We are looking for franchise owners who are outgoing, results oriented, and have sales, marketing, and/or management experience. A person who can lead a team and who has the motivation to excel and grow his/her business. Our ideal candidates are those who have "topped out" in corporate America and are looking for a change in lifestyle in order to control the pathway to their own future and generations to come. You must have a minimum of $150,000K in liquid capital and be ready to make a full-time commitment in order to grow your business to it's fullest potential. 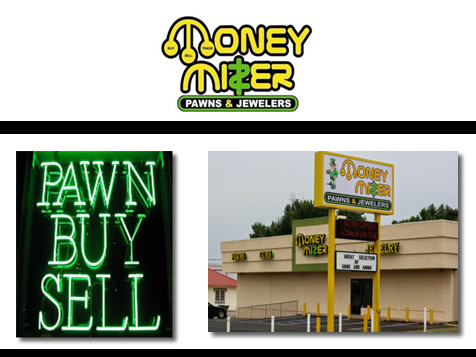 Money Mizer Pawn & Jewelry is revolutionizing the pawnbroker industry, bringing its specialty niche money services and quality retail products to a wider range of clients. We are offering qualified individuals an opportunity to join a franchise system of highly-motivated, select franchisees in an innovative and richly rewarding money services and retail opportunity. Money Mizer Franchise Division, Inc. is positioned to help franchisees start at the leading edge of a venerable industry with burgeoning potential. Come grow with us, as we continue to explore new market opportunities!